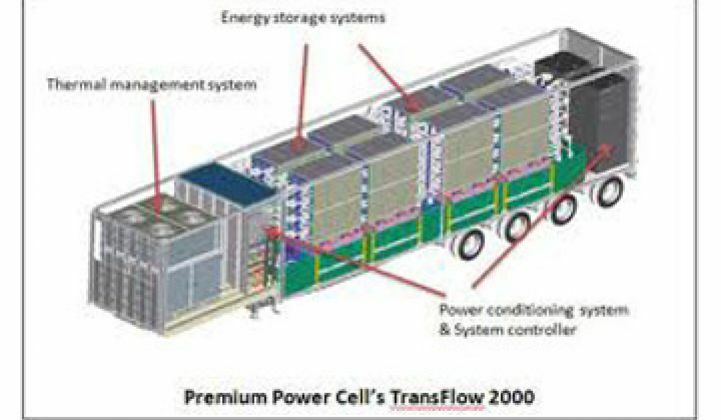 Flow Batteries Coming Into Homes? For approximately $7,500, you might soon be able to get a 30-kilowatt-hour flow battery to match your solar panels. Sacramento--Flow batteries soon won't be just for utilities and cell phone carriers anymore if Premium Power is right. 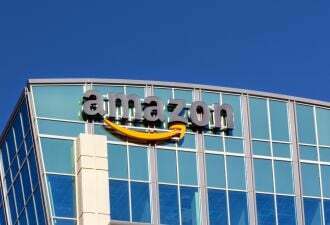 The North Reading, Mass.-based company is currently working on a device called the HomeFlow, a scaled-down version of the zinc bromide flow batteries it currently sells to industrial customers. The HomeFlow will store approximately 30 kilowatt-hours of energy, have a 10-kilowatt rating, and cost around $7,500, said Doug Alderton, director of government sales at the company during a session at the Emerging Technologies Summit earlier this week in Sacramento. The price includes an inverter, so if you are linking it up to a solar system, your costs will be lower. If successful, the batteries will help delay grid upgrades. Other applications exist as well. Lee Burrows of VantagePoint Venture Partners in an earlier interview suggested that flow batteries could be used to recharge electric cars instead of high-speed charging stations. And, like Dell, the company wants to make them cheap. Most of Premium's flow batteries cost $250 to $300 a kilowatt hour or $250 to $350 a kilowatt. That's incredibly cheap. Rival Deeya Energy last year came out with flow batteries that cost $4,000 a kilowatt. A123 Systems, which makes lithium ion batteries, makes battery packs that are close to $1,000 a kilowatt hour, said company exec Charliee Vartanian at the same conference. The company's batteries last 30 years and take up 1/15th of the space of conventional batteries, he added. Whether and when Premium Power can achieve its goals remains to be seen, but the potential is intriguing. 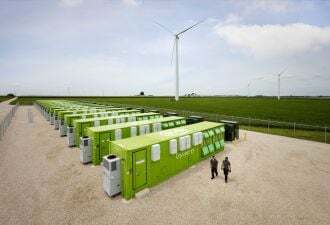 At these rates, storage could be added fairly easily to wind farms and solar arrays. Government officials and developers in Africa have been regularly calling the company to see if Premium's batteries could power microgrids. Flow batteries pretty much act like their name suggests. A charged electrolyte infused with zinc and bromide ions flows from one tank to another. The trick is in coming up with a battery design that allows the zinc to continually be recycled. After zinc bromide is broken up into its separate elements (a key part of the process for harvesting electrons), the zinc adheres to plates inside the battery. That plate has to be polished before the recharging process can begin again. Zinc bromide, he added, is a byproduct of shellfish. In other words, there's a lot of it.